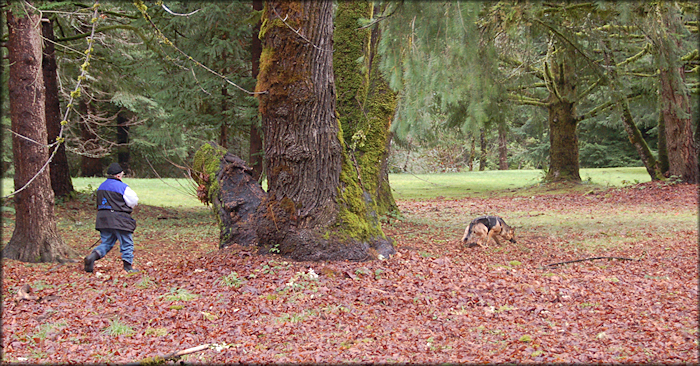 Any dog can track - their scenting ability is outstanding. But it requires a dog willing to work for you to learn to follow a specific scent you select for as long and as far as you want. Tracking teaches you to trust your dog. You need to learn to read your dog. The dog knows where the track is and you will not during the tracking tests. That is a very valuable lesson. 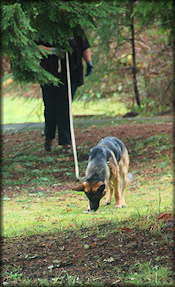 Tracking can be started with a young pup and continued on to whatever degree of difficulty you want. Tracking does not always need wide open spaces - an empty parking lot, a park, an empty school ground ... there are lots of tracking opportunities even in a city. The AKC currently offers 3 Tracking titles. Tracking Dog (TD) - The begining title requires a track some 1/4 mile long with several turns, on a single type of surface and with an article at the end. Tracking Dog Excellent (TDX) - longer and older track with changes of terrain, 2 cross tracks and several articles. Variable Surface Tracker (VST) - A difficult multiple surface track with multiple articles. Surfaces include pavement. For more information about Tracking, come and to our club meetings and meet our Tracking fans.